Wow. Many doge. Very wallet. Be a good shibe and move your mouse around. 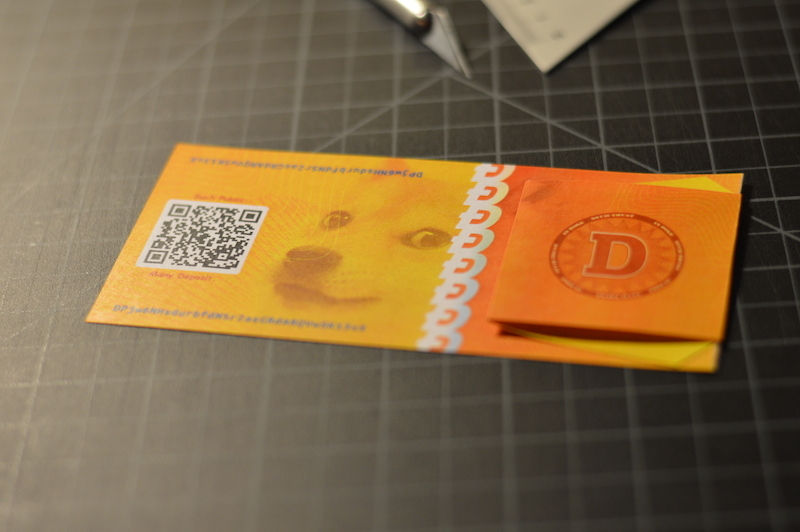 Print out a beautiful and secure wallet for your dogecoins. 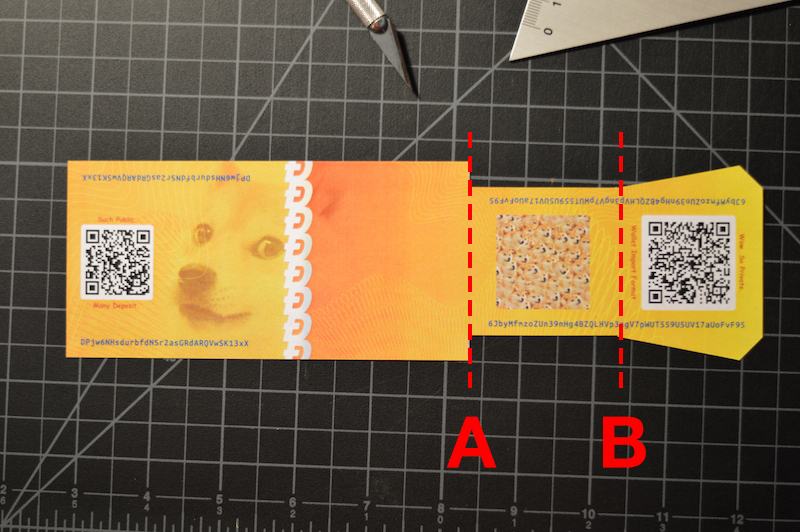 Looking for a comprehensive guide to using dogecoin paper wallets? Check out Dogecoin Tutorial! Before printing out a wallet you'll need to "calibrate" your output using the zoom and horizontal shift adjustments to accommodate your particular browser / printer combination. Without proper callibration, your wallet may print out too small or with a misaligned reverse side. Next we'll print out the front side of your wallet. A public address and private key will automatically be generated, or you can supply your own key if you are using 'vanitygen' or some other random key generator. Then you will put the same page back in your printer (but flipped over) to print out the back side of your wallet. This isn't just for good looks: the back side design includes additional tamper-resistant safeguards. Find your scissors! The final step is to cut out your wallet, fold it, and seal it with opaque (light-blocking) tape. 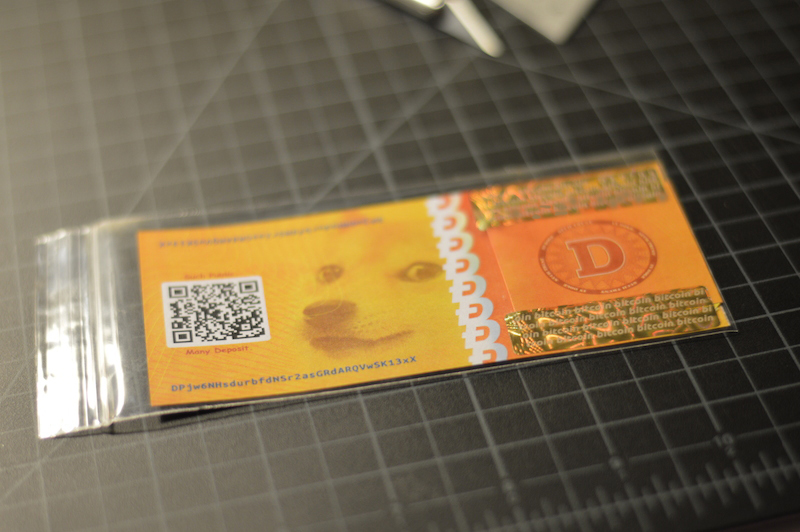 Now you're ready to transfer dogecoins from your online holdings to your new wallet. To calibrate your output, print out this page in LANDSCAPE (wide) format. Based on the results, adjust the "zoom" and "horizontal shift" until your printed ruler approximates a real ruler, and leaves equal margins on the left and right sides of the page. Place the sheet you just printed back into the printer (be sure it will print on the back!). And don't forget to print in LANDSCAPE mode! Send dogecoins to the address (or QR code) where your wallet says "Such Public." and "Many Deposit." And then verify the signature's fingerprint against Wells Riley's published PGP/GPG fingerprint.